Although the calendar says Spring, there’s still a nip in the air most days, and it will be a while before we in the Northeast U.S. can reliably leave the house without wearing a jacket or sweater. 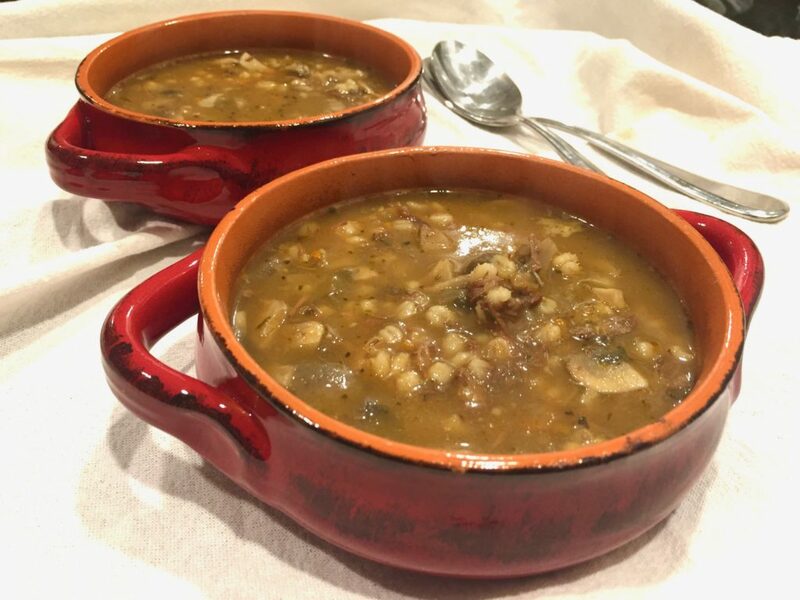 So for those days in between seasons, when it can still feel a bit chilly, this mushroom beef barley soup is like a warm hug at the dinner table. You can make this without the beef, but I found it an ideal way to use up a small bit of leftover pot roast I had made a couple of days earlier. It was only a couple of ounces, but when shredded and added to the soup, it added a real depth of flavor. 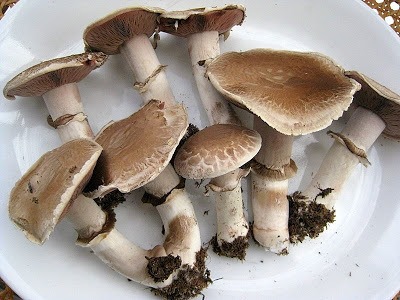 Use any kind of mushrooms you want – from supermarket white button mushrooms to shiitake. I used baby portobello mushrooms. I also added a parmesan rind to the soup as it was simmering, something I do with many kinds of soups. 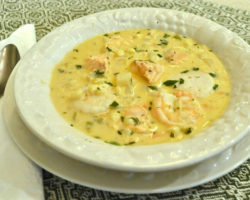 It takes only about forty five minutes from start to finish to make this satisfying and delicious soup, and with a side salad and a good loaf of bread, dinner is ready. Sauté the onion, garlic, celery and carrot in the olive oil over low heat, until limp. Add the butter and mushrooms and sauté a few minutes. Add the barley, the broths, the water, the parmesan cheese rind, the leftover beef stew plus the salt and pepper. 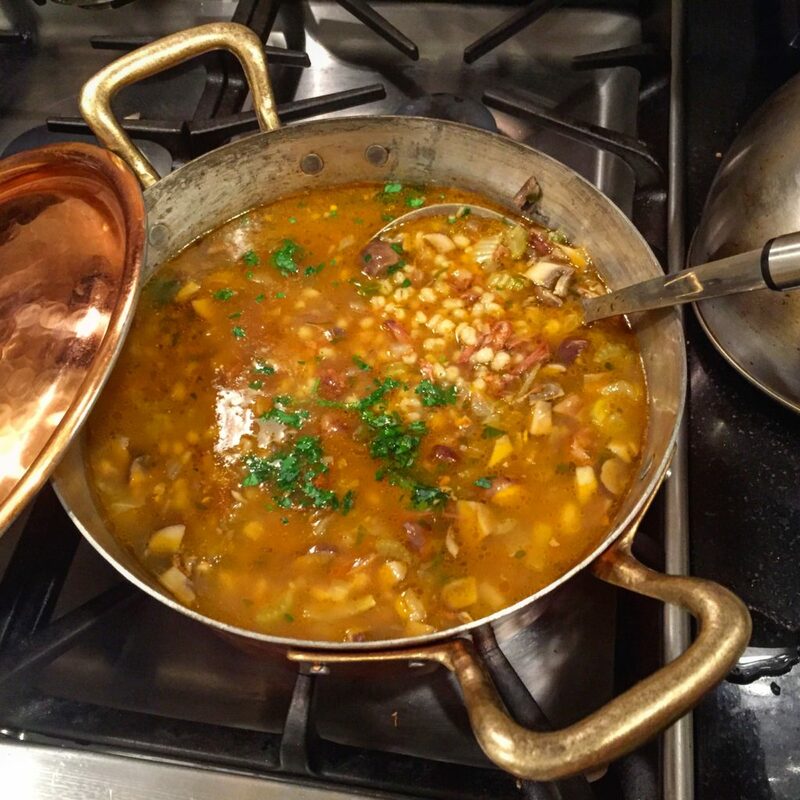 Cook over low heat for about 30- 45 minutes or until barley is softened and flavors have blended. Add parsley at the end, and serve with grated pecorino or parmesan cheese. 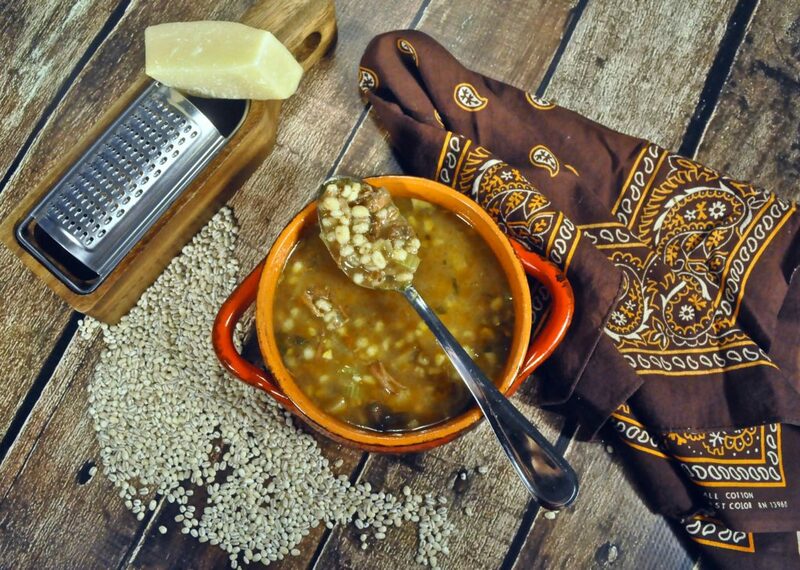 The barley will swell as the soup cooks and if the soup gets too thick, add more water. If you’re like me, dinner is often a consequence of what’s in the refrigerator, and on this particular night, I found a bunch of baby portobello mushrooms that needed to be used before they spoiled. I could have served them as a separate vegetable, but they seemed like a natural pairing with the pork chops I had just bought. 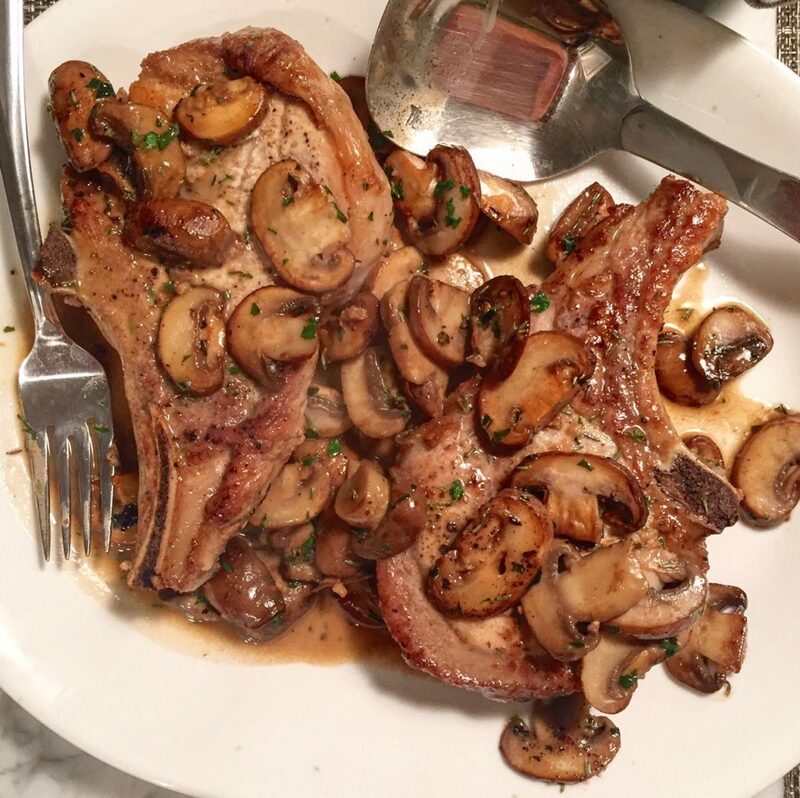 A little marsala wine, plus a small bit of cream that was left over, would elevate those pork chops from ordinary to sublime. It’s easy to overcook pork chops because they’re so lean. If you can find some with a little marbling, great, but that isn’t so easy. Marinating or brining helps, but knowing when to pull them off the grill or the stove is the most important step in avoiding a tough piece of meat. I don’t use a meat thermometer for pork chops or steaks, but instead have learned to test meat with the finger test. It’s got to have a little softness in it when you touch it, like the fleshy part of your hand. If you let it cook until it feels hard, then it’s overcooked. It takes getting used to, but once you’ve mastered it, you’ll never overcook meat again. Click here to get a more detailed guide on using the finger test for doneness of meats. About an hour before cooking, marinate the pork chops in the olive oil, soy sauce and minced garlic. Melt the butter in a pan and sauté the mushrooms on high heat. You want to get a nice sear on the mushrooms and let the water in them evaporate. When the mushrooms have turned a nice golden brown color, remove them from the pan and set aside with any remaining liquid from the mushrooms. Drain the pork chops from the marinate and dredge them in flour, salt and pepper. Shake off any excess flour. Place the oil in the same pan as you cooked the mushrooms and turn the heat to medium high. Add the pork chops and quickly sear on each side. This should take only a couple of minutes on each side. Lower the heat, add the marsala wine and the chicken stock, stirring to incorporate them. Flip the pork chops once to give both sides exposure to the liquid, then add the cream and swirl in, flipping again. Add the mushrooms back to the pan and cook until everything is heated through and just until the pork chops are done. Do not overcook. The meat should still have some "give" in it when you press it with a fork or with your fingers. If it's overcooked, it will feel hard. 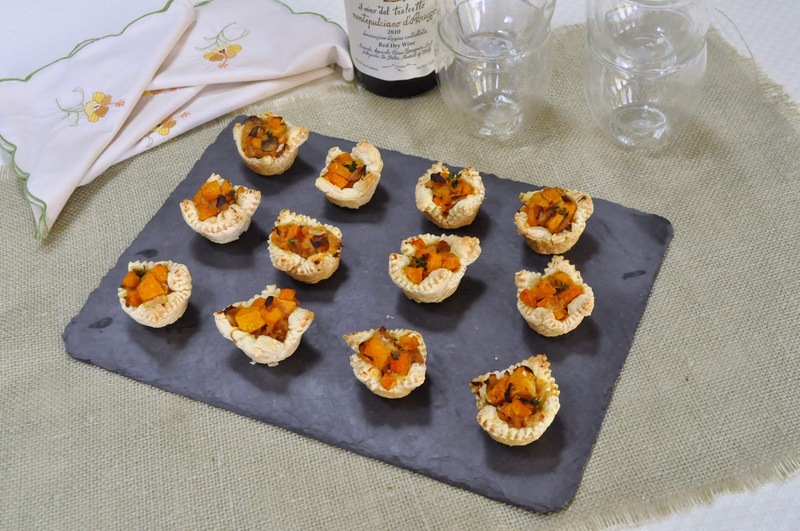 With the holidays approaching, you might want to have a few recipes for appetizers at the ready. 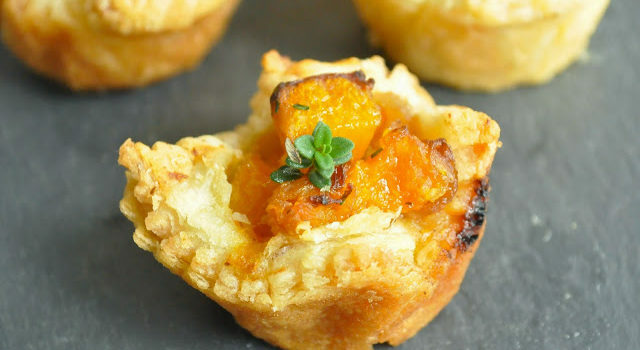 These puff pastry bites couldn’t be easier. They freeze well too. You use packaged puff pastry dough, and in my case, leftover vegetables. 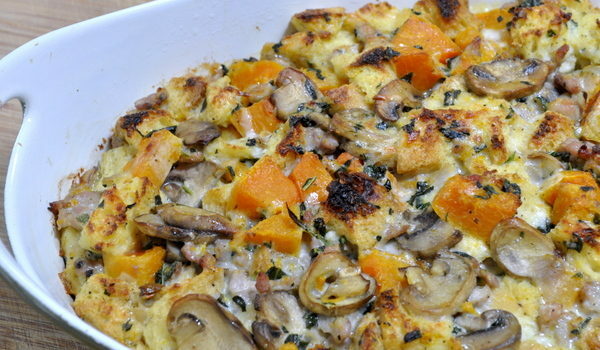 I already had some roasted butternut squash, swiss chard, mushrooms and caramelized onions for the gnocchi dish I posted here. But I had more than I needed, so I transformed the leftovers into these appetizers. Use any vegetables you like – artichoke hearts, broccoli bits or spinach also come to mind. Add some cheese too, for a richer taste. For the ones below, I just cut the pastry into little squares and popped them into a mini muffin tin, then filled them with the squash and caramelized onions before baking. 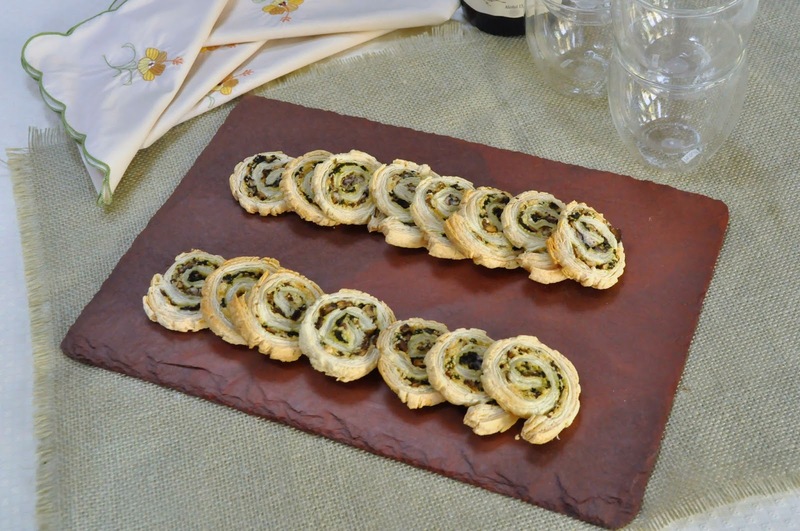 For these spirals, I rolled out a sheet of the puff pastry and spread it with a mixture of the chopped Swiss chard and mushrooms. Then I added a layer of asiago cheese and rolled it up like a jelly roll, sliced it and baked it. 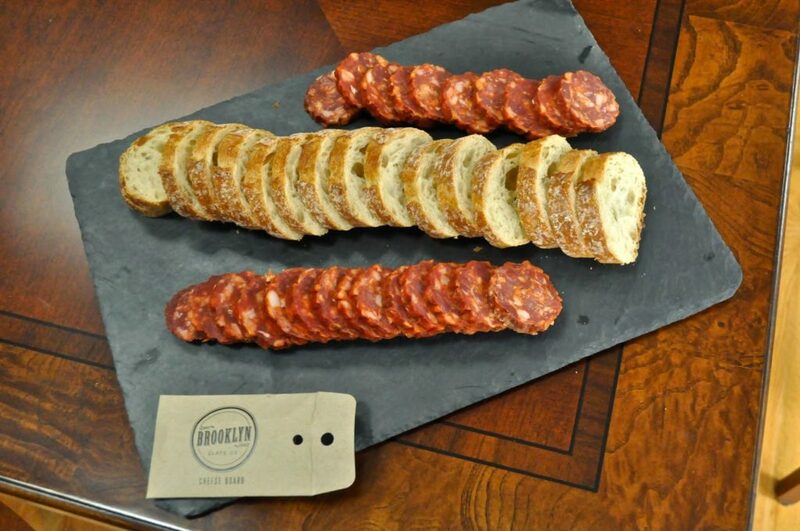 I served them on these handsome slate boards that were sent to me by Uncommon Goods. The company sells a variety of high quality gifts, for men, women and children. You’ll find a plethora of holiday shopping ideas on their website, including these beautiful slate boards.They’re made by Brooklynites whose family has owned a quarry in upstate New York for three generations. They’re available in both a grey slate and a terra cotta color too and they look great when serving all sorts of food. They’re perfect for serving cheeses too, and arrive with pieces of chalk, especially useful if you’re offering different kinds of cheeses. The company has a variety of other gifts available too, for both home entertaining or appropriate for gifting to men, women and children. Check out their site here. 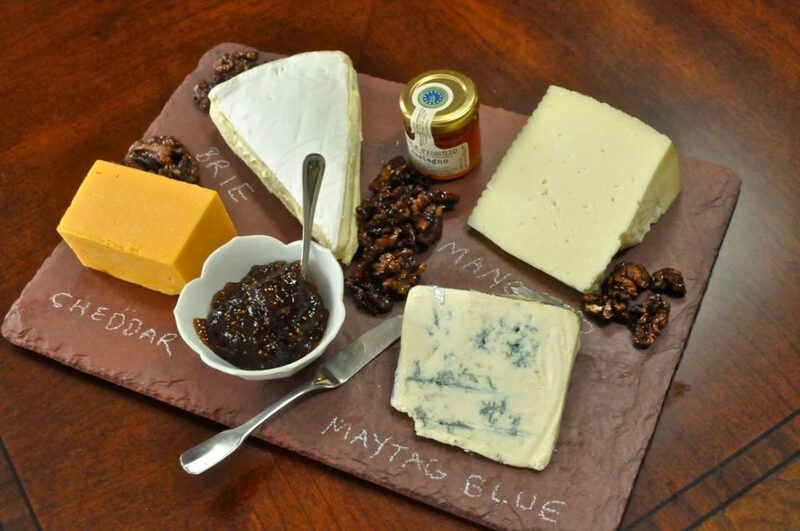 Wouldn’t you like to have one of these slateboards to use for your holiday entertaining? Just leave a message in the comments on the blog (NOT on email) saying whether you’d like the grey or terra cotta colored slate, and be sure to leave a way for me to contact you – email is best. I’ll have the computer generate one lucky winner and the company will mail you the slate board a short time later. You’ll love it! Sauté the onions in the olive oil until golden. Remove from the pan, set aside, but cut into small bits. Add 2 T. more olive oil and sauté the squash, adding a bit of water if the squash starts to stick to the pan. 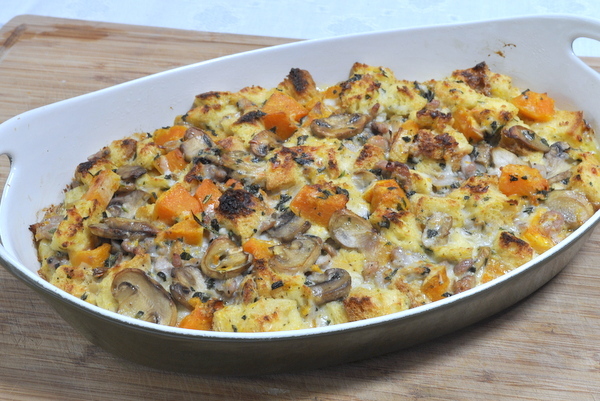 Season with salt, pepper and herbs, and when the squash is cooked through, add the onions back to the pan. Spray a small muffin pan with non-stick spray. Cut the puff pastry in small squares and push them down into the spaces in the muffin pan. Fill with a mixture of the vegetables and bake in a 400 degree oven about 20 minutes or longer, or until the pastry is golden. chopped spinach that’s been sautéed with minced onion, salt and pepper, mixed with sautéed, minced mushrooms (mine were leftovers). Spread some grated asiago cheese over the vegetables, then roll like a jelly roll. Cut into slices about 1/4 inch thick, then place on a cookie sheet and bake in a 400 degree oven about 20 minutes or longer, until pastry is golden. The headline is a misnomer. 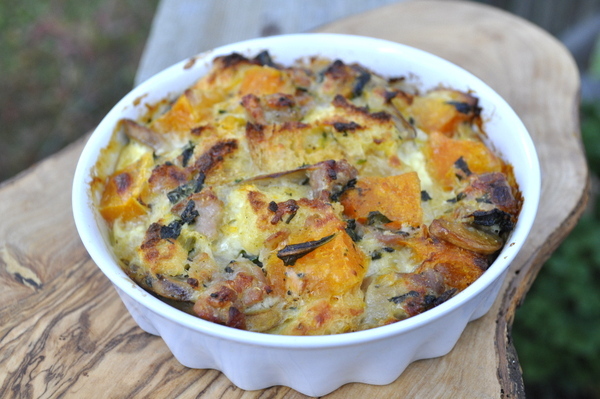 I should have called it Butternut Squash, Mushroom, Sausage and Kale Bread Pudding. But that was a mouthful – granted, it’s a good mouthful, but too long for a title of this recipe. 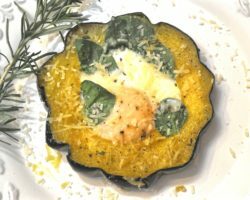 Anyway, it’s that time of year when butternut squash is abundant — a vegetable that just screams “fall.” I love it in soups, simply baked with olive oil and salt, or gussied up in lasagna or casseroles like this one. I served this as a main course, with a salad alongside, but you could leave out the sausage and serve it as a side dish. Thanksgiving will be here before you know it and it would be perfect on the table alongside Tom turkey. There are a number of steps, but it’s easy to make ahead of time if you want. Keep the bread and the squash cubes in sizable chunks when you cut them – not too teensy so they don’t disintegrate into unrecognizable pieces after baking. After all the ingredients are sautéed, sliced, etc. place them in a bowl. Add the eggs and cheeses and mix everything together with a spoon. This is what you end up with – a large casserole that feeds lots of people – at least a dozen if it’s a side dish or six if it’s a main course. 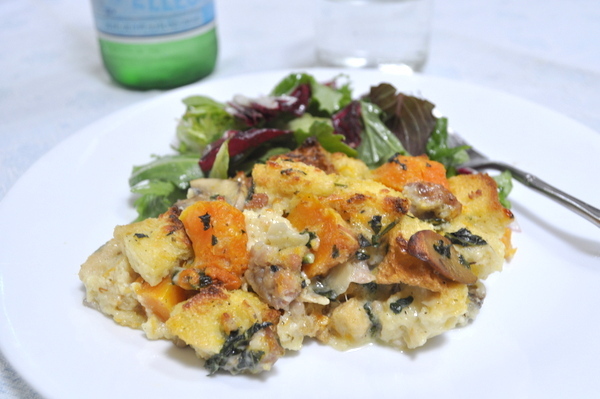 Or bake it in a lot of smaller dishes if you want individual portions. Either way, it’s delicious, so get busy. And dig in. In the photos, I used 1 cup kale, but I’d use more next time I make it. You can add or subtract any of the vegetables, and even leave out the sausage to make it completely vegetarian. *I make seasoned salt at the end of the summer, by harvesting a lot of herbs and blending them with kosher salt. Use any combination you have – rosemary, thyme, sage, lemon balm, etc. I went heavy on the sage last year and it makes a great seasoning for the Thanksgiving turkey as well as recipes like this. Spread the mixture on a cookie sheet and let it air dry for a day or two. When the herbs are completely dried, place the mixture into the blender or food processor and blend finely before placing into jars. Cut the squash into cubes – not wimpy ones, but about 1 inch cubes. Oil a cookie sheet and toss the squash cubes in the oil. Season with salt, pepper and the dried sage or sage salt or herbs de provence. Go easy on the salt if using the sage salt. Bake at 375 degrees for about 40 – 45 minutes. Cut the bread into large cubes and put it in the oven for about five minutes while the squash is cooking. Remove to a large bowl. Meanwhile, saute the minced shallot in the olive oil and butter until wilted. Add the minced garlic and saute briefly until soft, then add the mushrooms and cook them through. When the mushrooms are browned and nearly done cooking, add the chopped kale and saute for a few minutes. If necessary, add a little more oil. Season all with salt and pepper, then remove from the pan and place all the cooked vegetables in the bowl with the bread. Use the same pan to cook the sausage. Remove the casing from the sausage and break up the meat in the pan, cooking it through. Add a little more olive oil if there’s not enough in the pan to keep the meat from sticking. 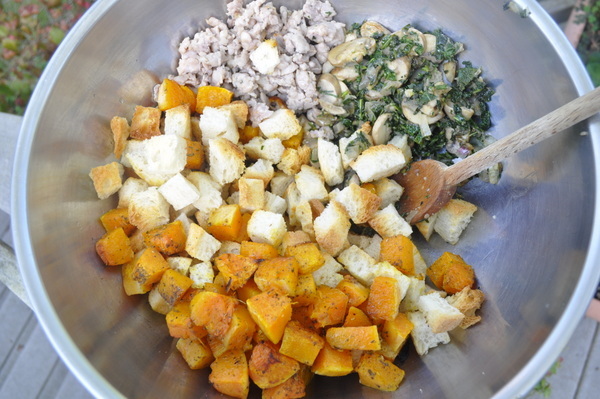 Add the cooked sausage to the bowl with the vegetables, along with the squash when it is cooked through. 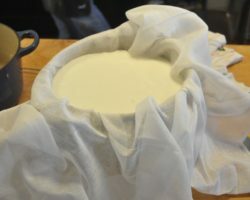 Whisk the eggs, then add the half and half and milk and stir in the cheeses. 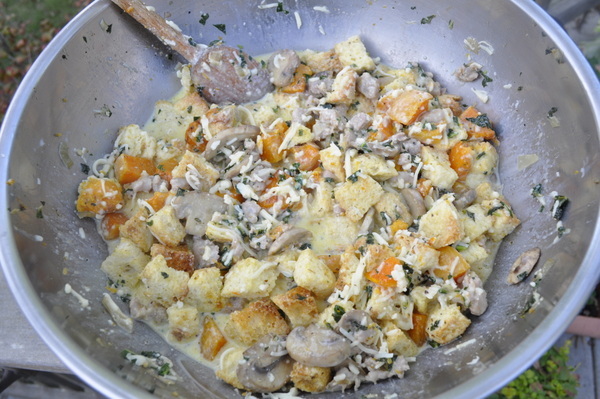 Pour the mixture into the bowl with the bread, the sausage and the vegetables and mix it all together with a wooden spoon. Let it sit for at least 10 minutes for the bread to absorb some of the liquid. You can even make everything to this stage and let it sit in the refrigerator overnight. Pour it into a greased casserole dish – mine was oval but it measures roughly 9 x 13 inches. Bake it at 375 for about 35 to 40 minutes. I also turned on the broiler near the end to achieve a little more browning. This also reheats very well as leftovers. This dish was quickly thrown together with our first portobello mushroom harvest. I sliced the mushrooms, sauteed them in some olive oil and butter with a shallot and minced garlic, added a little white wine and some pasta water, salt and pepper and that was it. But it still needed some umph, which is why I thought to add the ham. If I were making this vegetarian, I’d kick up the heat with more cracked black pepper. I had only a couple of slices of prosciutto cotto in the fridge, which was plenty for just two people. Prosciutto cotto is a very delicate cooked ham and could be kind of hard to find depending on where you live. But you could substitute regular baked ham, or even prosciutto crudo if you like. Another option that would be delicious is to fry up a slice of pancetta or bacon and add that. There are lots of variations, but to me, turning out a tasty dish with what you’ve got on hand is important – not only because you don’t want to always be running to the store, but so that you learn to become resourceful and not waste anything either. It can lead to interesting combinations that you’d never have thought of otherwise. I finished the dish off with a scattering of parsley and a dusting of freshly grated parmigiano cheese. Not bad for a quick meal, as my mother-in-law used to say. Get the water boiling and throw in the pasta. Saute the shallot and garlic for a couple of minutes in the olive oil and butter, then add the mushrooms and saute until cooked through. Season with salt and pepper. Add the white wine and cook for a few minutes on high heat to reduce a bit. Add a little pasta water too at this time, but only a few tablespoons or so. 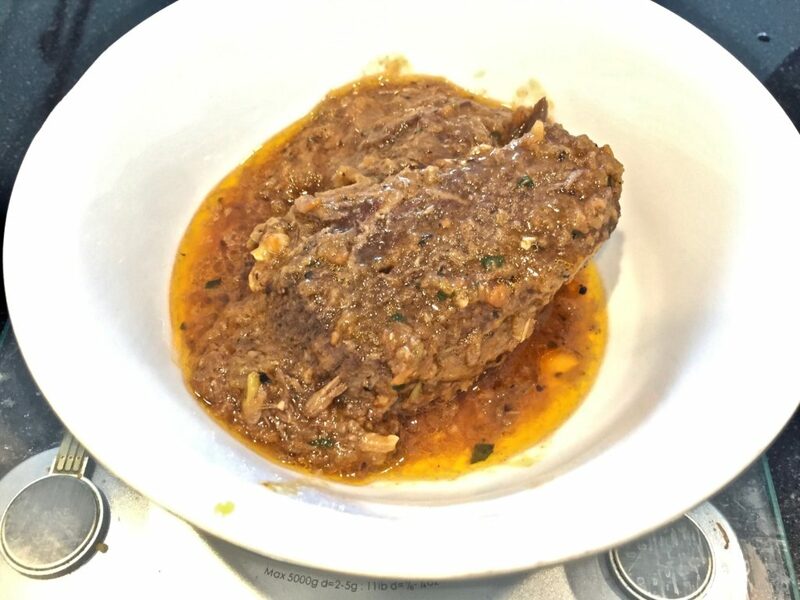 As you can see from the picture, this is not a dish that is swimming in sauce, but you should have enough for a light coating of liquid. Lower the heat to a slight simmer until the pasta is finished cooking. 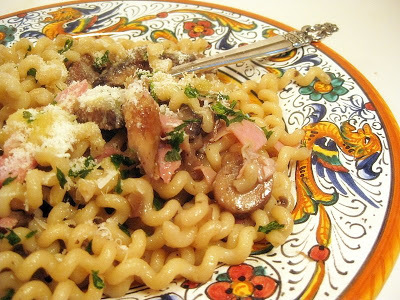 Drain the pasta and add it to the pot with the mushrooms, stirring around in the sauce to coat the pasta. Remove from the heat and put into a serving dish. Add the ham, top with parsley and parmesan cheese and serve. Yes, that’s right, these delightful portobellos popped up as little brown buttons a few days ago and quickly er…… mushroomed to these large beauties in a couple of days. I ordered the mushroom kit as a Christmas gift to my husband and another one for my father. There were quite a few companies selling the kits via the internet, but I ordered mine from a company in California. Email me if you want specifics. ling through the Italian Abruzzo countryside last fall. There we were on a country road, tootling along (is that a word?) when I see a sign with an arrow that says “Fungaia” (mushroom growing place). “Stop the car,” I shout. “Let’s go find the mushrooms.” Always up for a new eating or gardening discovery, my husband quickly turns the car around. We end up a few minutes later at the fungaia – a quanset hut with a sign out front instructing visitors to ring the bell for assistance. Which we did. 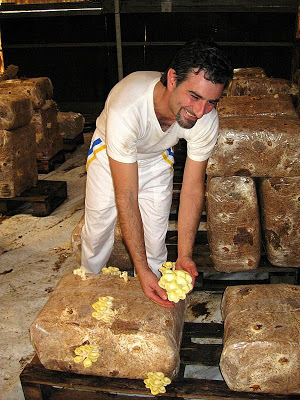 A few minutes later, a very handsome young Italian man appears to show us inside – a vast space filled with what look like bales of hay and two different types of mushrooms sprouting all over them. 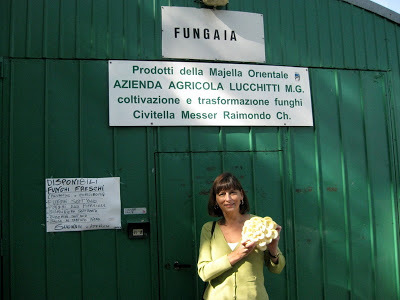 After a tour of the fungaia and a brief stop at the shop next door, we leave with a basketful of fresh oyster mushrooms (pleurotis), and a jar of mushrooms preserved in olive oil to take back to the U.S. Worth the detour, wouldn’t you say? So back to the kit… A few days after Christmas my husband followed the easy directions that came with the box. Only a few simple instructions and we were off and waiting. We would have had our first crop earlier, if only we hadn’t initially stored the box in a place that was a little too cool. Fast forward a few days to the dining room – a warmer climate than the guest room – when the little buttons appeared. A few days later and we were ready to harvest our first crop. Which is just what I did earlier this week. 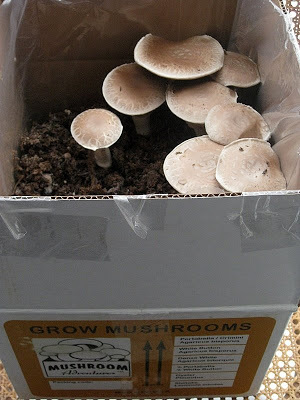 The mushrooms are supposed to keep producing with two very large crops and then a tapering off to smaller harvests. When all the nutrients are exhausted, the fungi stop doing their thing and go to mushroom heaven, or a compost pit in our case. In the meantime, I’m going to have fun turning these into some delightful eats. Look for a recipe to follow. That is, if you can peel your eyes off this good-looking Italian dude who works at the fungaia. 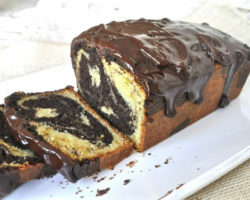 Don’t make this if you’re worried about cholesterol. I use a half stick of butter and a half-pint of cream for this recipe. But it’s not the kind of soup you’ll make everyday. It’s a special occasion soup. I ate it at a very special occasion — the wedding of my nephew Greg and his bride Shea — in a lovely setting in Montreal, Canada. 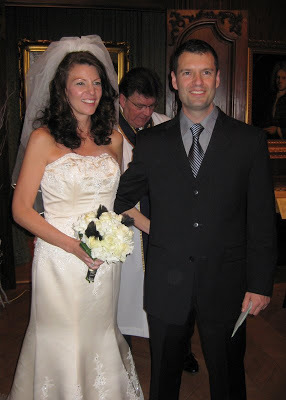 The ceremony took place at Chateau Ramezay, a structure built in 1705 that served as the residence of Montreal’s governor at that time but is now a museum. The reception was held at Duel, a Montreal restaurant whose two chefs maintain a friendly rivalry between Asian and modern French cuisine. I tried to duplicate one of the courses we ate (since the chefs never responded to my request for their recipe) and if my attempt is not exactly the same as theirs, it’s pretty darn close — and pretty darn good. I really wouldn’t be too concerned about the calories and cholesterol either. The recipe makes enough to feed eight people. So if I calculate the damage spread throughout that many servings, I think I feel better already. 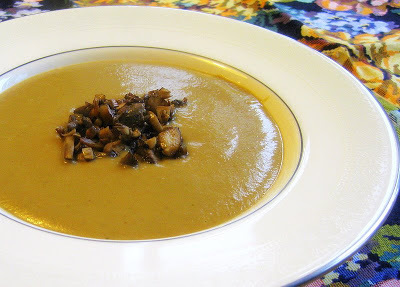 Soak the porcini mushrooms in 2 cups tepid water for at least 1/2 hour. In the meantime, melt the butter and saute the leeks, onions and garlic until transparent. Drain the mushrooms, which have been soaking, and save the soaking liquid. Chop the dried mushrooms and add to the pot with the leeks, onions and garlic. Add the fresh mushrooms, except for about 1/2 cup that you reserve for the end garnish. Continue to saute everything until the mushrooms are cooked through. Strain the water where the porcini were soaking and add to the pot. Add the rest of the ingredients, except the heavy cream. Simmer for at least 1/2 hour or until the potato is cooked through. Put everything into a blender and blend until totally smooth. You’ll have to puree everything in about three separate batches. Pour the puree into a clean pan and add the cream, stirring until everything is blended and heated through. Serve with the mushroom garnish floating on top. 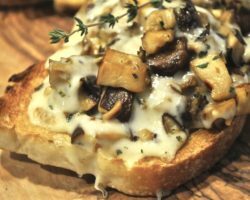 To make the mushroom garnish: Chop up the remaining 1/2 cup of mushrooms and saute in a couple more tablespoons of butter. For all you meat lovers out there (and I’m one of them), this is a recipe that will have you forget that you ever made friends with a T-bone steak. 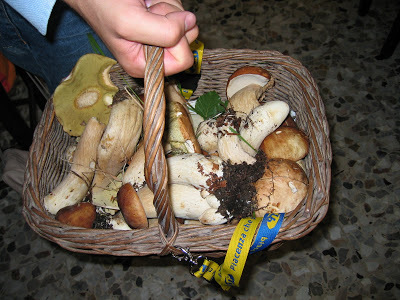 For those of you who have ever eaten freshly harvested porcini mushrooms, grilled and dressed simply with olive oil and garlic, you know what I mean. 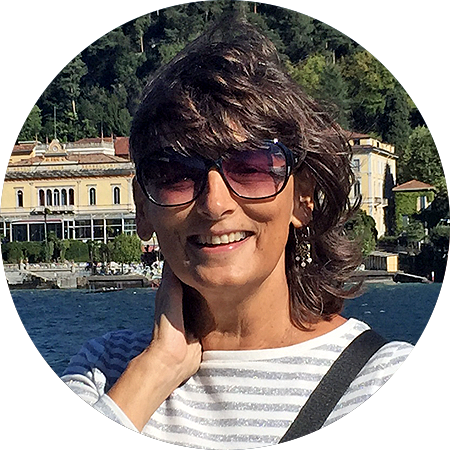 The ones in the first photo were gathered by a local resident in Cassimoreno, a small hamlet in Emilia Romagna where my cousins Maria Luisa and Angelo have a country home and where nearly everyone hunts for mushrooms in the fall. But alas, we’re not as fortunate here in the northeast U.S. to have a mycologist as a next door neighbor — or a forest nearby with porcini nestling beneath the leaves waiting to be plucked. Fresh ones in the markets where I live are hard to come by, and when you can find them, they’re practically as expensive as a flight to Italy. 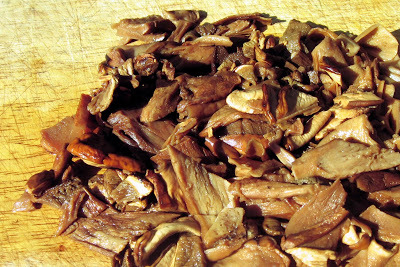 Fortunately, you can find dried porcini mushrooms in many specialty shops and even supermarkets nowadays. You might pay $6 or $7 for a one-ounce package wrapped in cellophane, and that’s enough for this recipe that will serve four people. full of impurities. I always respected his opinions on food, but this was one place where we parted ways. To me, it would be criminal not to add that aromatic liquid to this recipe. Just make sure you strain it first. 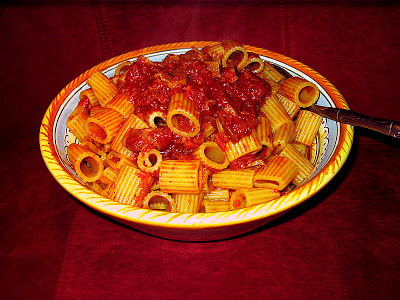 I also use canned San Marzano tomatoes in this dish, and they really do make a difference. They are easily available in supermarkets. Grown in an area near Naples, where the volcanic soil influences the outcome of the product, they are much sweeter, much stronger, and less acidic than the typical Roma plum tomatoes that are used by many canners. 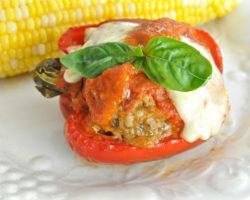 You can use other types of canned tomatoes, of course, but this dish just wouldn’t be the same. Soak the porcini in the water for an hour or until mushrooms are soft. Pour the olive oil into a saucepan, then add the minced onion, carrot, celery, garlic and saute until translucent. Drain the porcini mushrooms, but reserve the liquid. Roughly chop the mushrooms and add to the pan, along with the tomatoes, breaking them through your fingers. Add 1/2 cup of the strained soaking liquid, wine, and remaining ingredients. Simmer for about 3/4 hour and serve over pasta.